Disclosure: this post and giveaway is sponsored by SABER Grills – For the Love of Food! 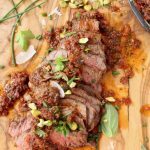 Quick and easy Italian sun dried tomato pesto with basil and garlic, drizzled over perfectly grilled steak with pistachios and fresh herbs. Because grilling season is officially here you guys. It was so hot today you can actually swim in the pool and not even be cold! 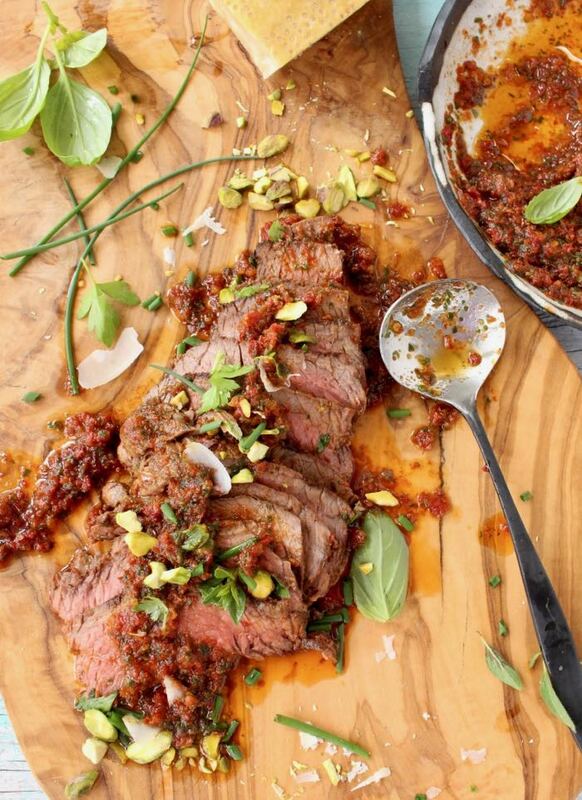 And who wants to heat up their kitchen when you can crank up the grill, buzz up an easy but oh so lovey sun dried tomato pesto spread to drizzle over a perfectly cooked steak and live your life ? Drink in hand, feet kicked up and everything! 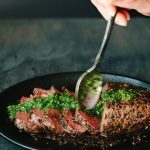 All you need to do is bring your steaks to room temperature for even cooking. While those rest you add a bunch of lovely things into the food processor, taste and adjust a couple of times until the pesto is just perfect. I made mine without the nuts and just sprinkled some chopped pistachios on top but you can add a handful of pine nuts, almonds, pecans or walnuts to your pesto. You could toss a green garden salad together as a side dish, go Paleo style or toss the leftover sun-dried tomato pesto with some fluffy gnocchi or your favorite pasta. It is also really nice over grilled salmon or chicken or as a spread in a sandwich. 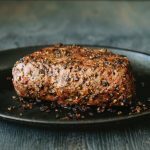 You can use sirloin steaks or fillets here as those cuts work great and are tender without any marinade. Just season them well all over and make sure to take the chill off of them before grilling. Lucky you because today I also have a fabulous giveaway and a chance for you to win a fantastic SABER Grill and other goodies below! Good Luck Friends! 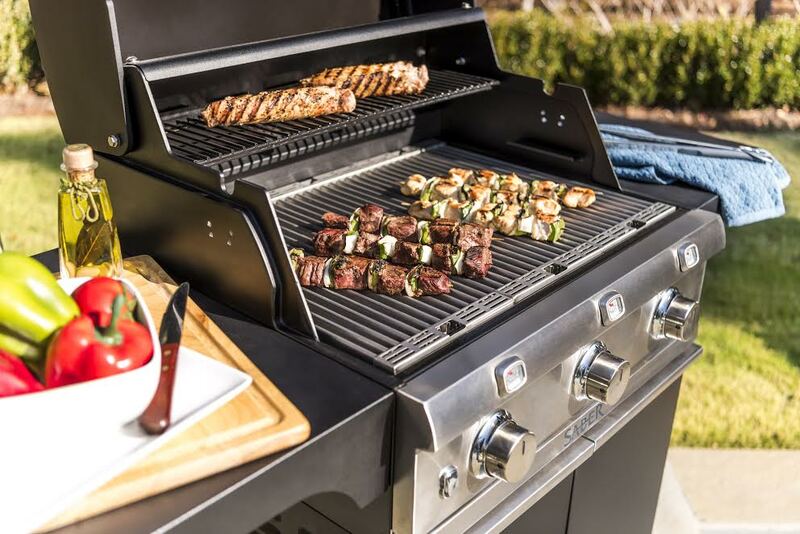 At the heart of all SABER grills is an advanced infrared cooking system that eliminates flare-ups and uses 30% less fuel than traditional gas grills. The system allows for true zonal cooking, so food that requires different temperatures can easily be cooked side-by-side. It also has a wide temperature range and a rapid pre-heat cycle. Read Saber Grill Giveaway Official Rules! Add all of the pesto ingredients to the bowl of a food processor and pulse until smooth to your liking. Taste and adjust seasonings with more sea salt and even garlic if desired. Add more olive oil as needed. Refrigerate until ready to use. If prepared a day in advance then bring it to room temperature for about 10 minutes before serving. Bring the steaks to room temperature for 15 minutes and pat them dry very well with paper towels. Drizzle with a lug of olive oil and sprinkle all over with the sea salt, black pepper and smoked paprika. Make sure to rub the spices all over including the sides. Meanwhile crank up the grill to medium high. Using a pair of tongues and add the steaks to the hot grill. Cook for about 4 minutes on each side for a 1.5 inch thick steak. Grill the sides as well for about 30 seconds each. Transfer the steaks to a plate and loosely cover. 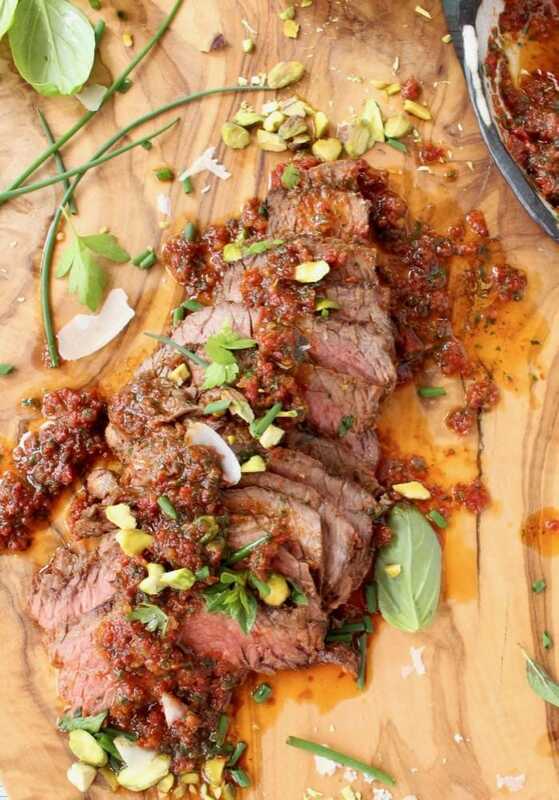 Allow to rest for 5 minutes before slicing and serving drizzled with the sun dried tomato pesto, pistachios and fresh herbs. Garnish with some shaved parmigiano reggianno cheese on top! I think the recipe looks great and the grill looks professional, can grill anything on it. 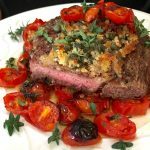 Tomatoes and pesto add a fresh, refreshing element to steak! This looks and sounds delicious! It’s different, can’t wait to try! Pinning!! This sounds amazing! I think I will be cooking up some steak this weekend! I love pesto and this one sounds fantastic!!!!! Bet it would be good on all kinds of meat so when I make it, I’ll definitely make extras! This recipe sounds great. 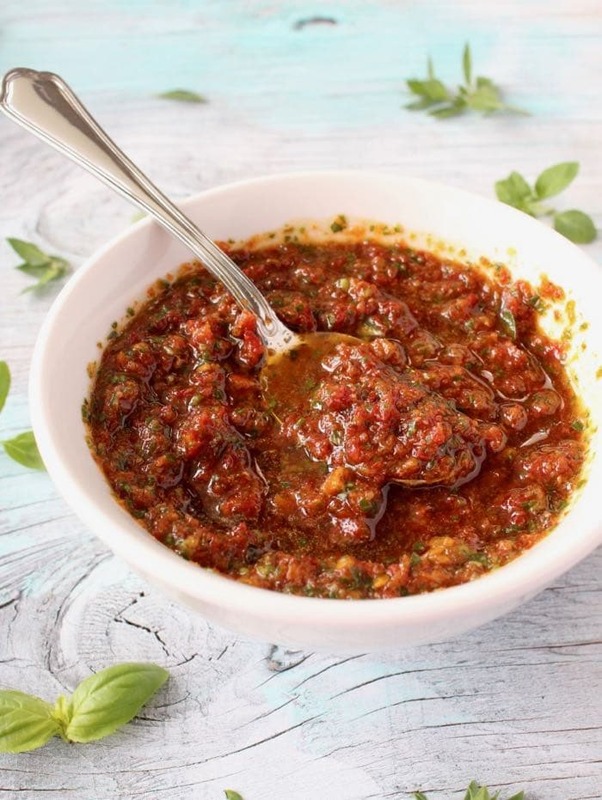 I would love the flavor of the sun dried tomato pesto. 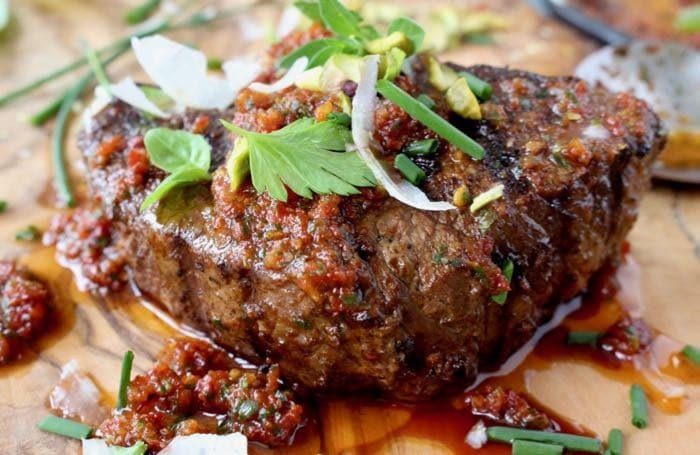 We just made a fantastic Grilled Porterhouse Sicilian Style — wish we could have had this grill. The one we have here is mediocre. Your steak looks yummy!! The recipes look and sound so good! Can’t wait to try them. Your recipe and this grill look amazing! 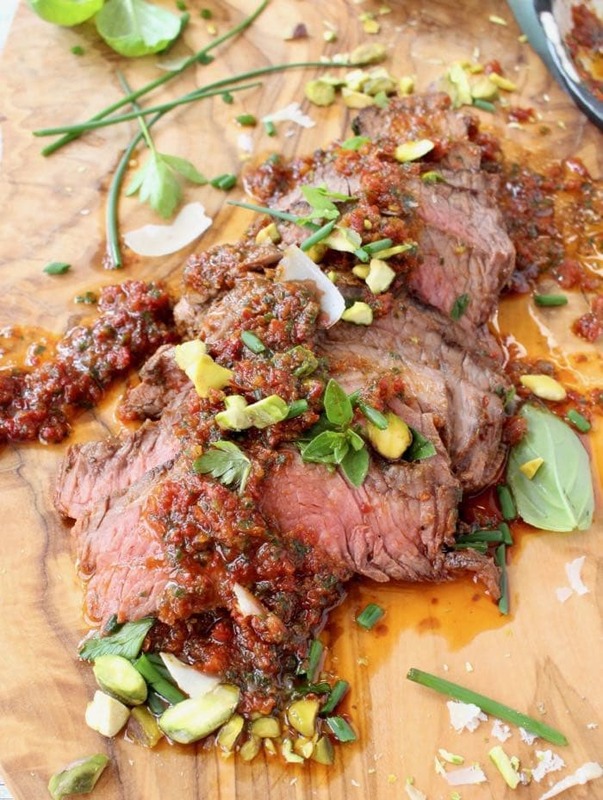 Everything tastes better prepared outside on a grill! I can’t wait for summer! The recipe sounds wonderful and the grill is so nice. i think saber grills look amazing and perfect for the kind of cooking we do in this house! Can’t wait to try this recipe! That pesto sounds just about perfect. I cannot wait to try out that recipe … and my new bbq! I think the recipe sounds good. I would have never thought to use chopped pistachios! The recipe looks so delicious! I am going to try it. A beautiful Saber Grill and so many recipes…a great way to celebrate the summer! I think the recipe is fantastic looking and the Saber Grill is awesome. So glad it’s grilling season! Thank you for sharing – this looks so delicious!! These look amazing! Love all the flavors! I love how versatile pesto is! The flavors you used sound perfect! What an absolutely PERFECT summer dinner! Seriously in love with the sound of this dish. I have heard such good things about infrared cooking systems and how they help produce much better meals on the grill. I love the look of this grill and this feature. 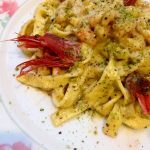 I am not usually a pesto lover but this recipe sounds and looks delicious and easy to make. I’ll definitely be adding this to my must try list for the summer. That sauce looks amazing! I’m sure it’d be great on everything! 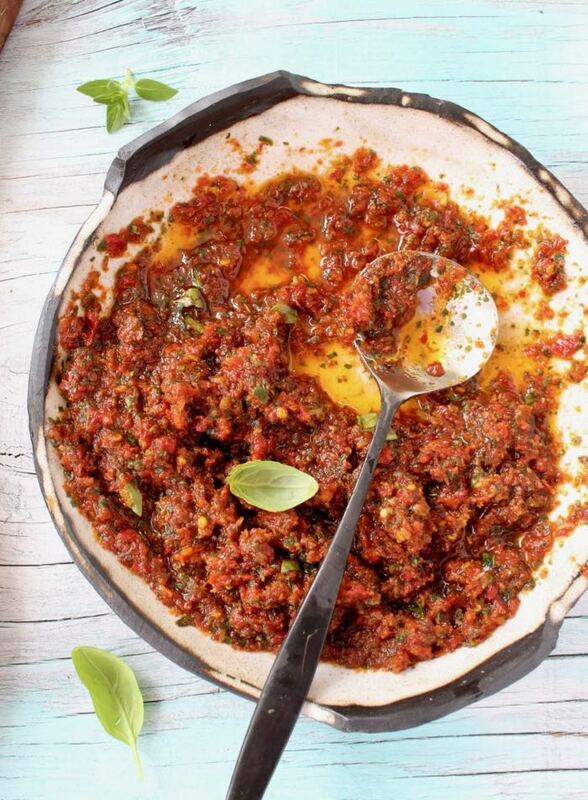 Sun dried tomato pesto is the BEST!!! I can’t wait to make this!